This topic will show you how to handle a common scenario where you have a RadBusyIndicator control having some content and you need to ensure that when the RadBusyIndicator is no longer visible, the focus will be returned to a specific control in its content. 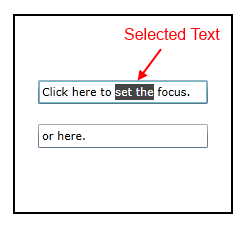 The following example will assume that you have a RadBusyIndicator control containing a TextBox and a toggle button which will trigger the busy state of the RadBusyIndicator. Whenever the RadBusyIndicator disappears the focus will be brought back to the TextBox control. To achieve this behavior you will have to bring the focus back to the desired control by yourself. 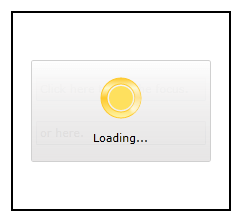 One way to do it is to track down when the RadBusyIndicator is enabled and manually set the focus. You do this by using the IsBusyIndicationVisible boolean property. Its value will be equal to True whenever the RadBusyIndicator is enabled and the busy content including the progress bar, is visualized. You might try to use the IsBusy property but it will not bring you to the desired solution because the IsBusyIndicationVisible property is updated after the IsBusy property. In the definition of the content element you will have to include the new behavior. In order to restore the focus on a Control that was focused before the RadBusyIndicator control was enabled all you need to do is save the focused Control and then reset the focus to it when the BusyIndicator is disabled. 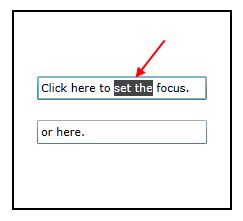 The next example shows how to save the last focused Control and reset its focus as soon as the BusyIndicator is disabled. For example purposes the RadBusyIndicator will be enabled/disabled with the use of a DispatcherTimer that will show and hide the control every five seconds for five seconds. You can download a runnable project of the previous example from our online SDK repository here, the example is listed as BusyIndicator / RestoreFocus.